Webserver Stress Tool - Performance, stress & load test. By simulating the HTTP requests generated by hundreds or even thousands of simultaneous users, you can test your web server performance under normal and excessive loads to ensure that critical information and services are available at speeds your end-users expect. Detailed test logs and several easy to read graphs make analyzing results a snap. Webserver Stress Tool for Windows (2003 R2, Vista, 7, 2008) can benchmark almost any HTTP server (e.g. static pages, JSPs/ASPs, or CGIs) for performance, load, and stress-tests. This test was run without downloading images. In our Sample Performance Tests section you can find a collection of test reports with detailed information about setup and results. This screenshot, for example, shows the spectrum of click times. See our Sample Performance Tests section for detailed test reports. The actual load you can achieve is highly dependent on your network infrastructure, your server/client hardware, the file sizes, and your web application. We also provide screenshots of Webserver Stress Tool. Webserver Stress Tool simulates lots of users by sending http-requests to a webserver. It works with almost any server based technology like asp, jsp, cfm, or java. Many different load patterns can be generated with this web testing tool. The simplicity of Webserver Stress Tool means any webmaster, programmer, or administrator of a web site can test a webserver/web application under heavy load in real-time. This provides unparalleled ability to quickly adjust webserver configurations for optimal performance (i.e. when a new feature or content is launched). How long does it take to learn the usage? Any webmaster or network administrator can use this web testing tool with little guidance. If you want to see how simple it is to assess your webserver using Webserver Stress Tool please have a look at the manual. How long does it take to install and be running? After running the standard installer it takes a few minutes to configure and start a test. Several users reported to us that they found a long searched bug in their software within 15 minutes after downloading and installing Webserver Stress Tool. Paessler provides a detailed, printable PDF help manual that is both included in the software and downloadable from this website. Webserver Stress Tool also features the same support content integrated into a helpfile. Can I meet with users who are achieving real benefits using this tool? On our case study page you can find several case studies for Webserver Stress Tool. What volume and throughput can the tool cope with? 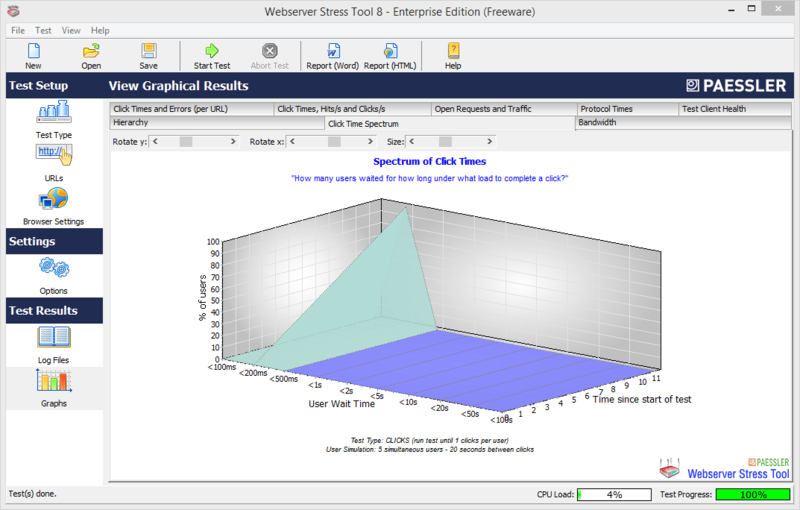 Webserver Stress Tool can simulate anything between 1 and 10,000 users. The maximum number of simultaneous users that can be simulated successfully depends on the power of the client machine Webserver Stress Tool runs on, as well as the Windows version used on that machine. E.g. we have tested up to 10,000 users on a Xeon 2.8 Ghz machine with hyperthreading on Windows XP. For details, please see System Requirements. What environment is needed to run this tool? Webserver Stress Tool runs under Windows XP/2003/Vista/7/2008. The target webservers can be of any operating system. For details, please see System Requirements. How much disk space and RAM does it use? 5-10 MB of disk space plus space for the log files (can be several MB) and about 100 kb of RAM per simulated user. Why does Webserver Stress Tool show errors when I run it against my server? When I access the website with my browser I don't see errors. In most cases when people write us about errors when using Webserver Stress Tool, they have discovered exactly what Webserver Stress Tool is designed to discover: Problems with scripts or webservers that crash or fail when multiple users access it simultaneously. You can be quite sure that you have a server problem if you get errors other than "timeout" and "404." For example, the error code 500 (internal server error) is never generated by Webserver Stress Tool, but by the webserver.